Phase One of a two phase, $65 million renovation of the RioCan Yonge Eglinton Centre in Toronto was completed in early November, featuring 37 digital signs of varying sizes. 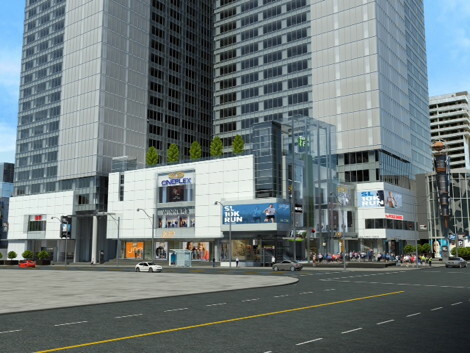 When phase two is completed by April, 2015, there will be a total of 75 units, including two LED digital screens measuring 14’ x 48’ on the Centre’s exterior. 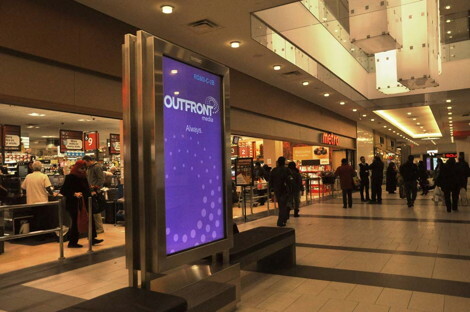 “What is special about it is that the digital signage was a planned component of the renovation,” says Michele Erskine, director of marketing, Outfront Canada, which is handling the digital signage throughout the Centre. Yonge & Eglinton is the second-busiest intersection in Toronto with a daily volume of over 120,000 (combined vehicle and pedestrian). At the hub of several affluent Toronto neighbourhoods, it is a strong shopping, dining & entertainment destination, as well as a vibrant daytime business district. The Eglinton subway station is a key transit hub on the Yonge subway line, while the Eglinton Crosstown LRT line, already under construction and scheduled for completion in 2020, will further increase the importance of this busy intersection. “We had a beautiful program on the screens for Remembrance Day when we launched,” says Erskine. Showpiece of phase one is in the central atrium where 72 55”screens make up one visually compelling giant screen. There are also 26 vertical screens, some freestanding and others wall hung, mainly 55” and 70”, mainly carrying advertising. And there are also some horizontal and some wayfinding screens. Some are in the food court; others are spread through the centre and in the subway concourse. 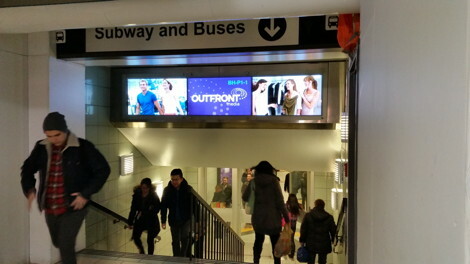 Content management software behind the Outfront Canada displays is by Concord, Ontario-based Omnivex, which is the preferred partner for all Outfront Canada digital signage. This entry was posted on Saturday, November 29th, 2014 at 10:00 @458 and is filed under Scuttlebut. You can follow any responses to this entry through the RSS 2.0 feed. You can leave a response, or trackback from your own site.